We're planning to cloth diaper Birdie. Although it's supposed to save a lot of money in the long run, there are those stash building costs, and you need few things along with the actual diapers and wipes. 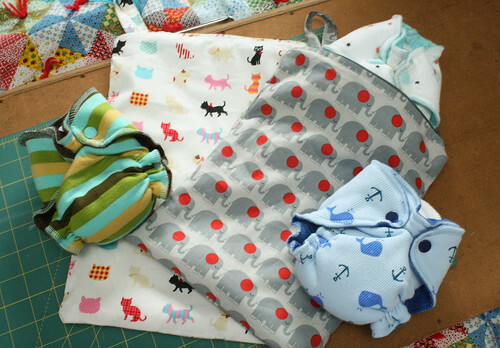 I had been browsing around for wetbags (waterproof zippered bags to store dirty diapers in when out of the house). Most I found were $15 a piece, my favourites being above $20 with no shipping to Canada (of course), which I was hesitant to spend. 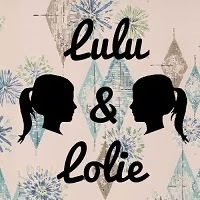 Don't get me wrong, I am willing to pay more for good craftsmanship (especially on Etsy, there's a lot of great really well made baby stuff on there), but with all we had to get, every bit adds up. 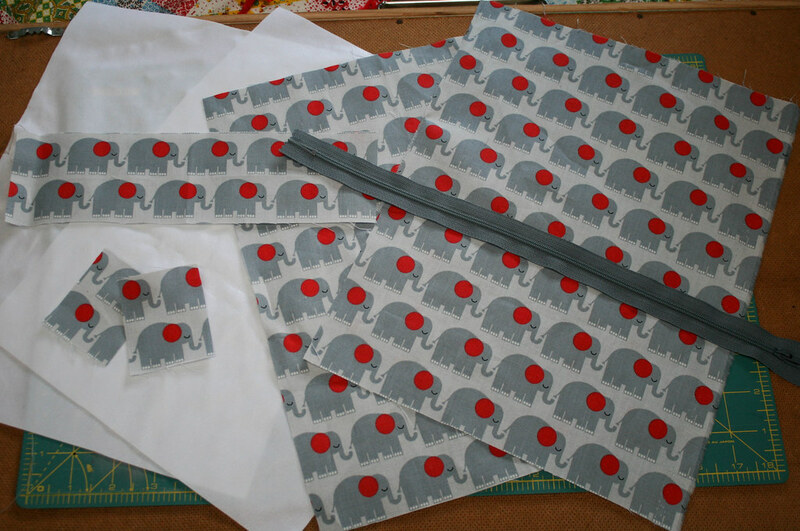 I had a lot of cute prints in my fabric stash and even some waterproof PUL left over from when I decided I would make my own cloth diaper covers (HAH! ), so why not make them myself? I did have all these grand plans of handmades for this baby after all. Most of that went out the window when my first trimester wasn't exactly as smooth as I had thought it would be. Growing babies isn't always glamorous. At least these would add a couple more handmades to our ever growing pile of baby items. 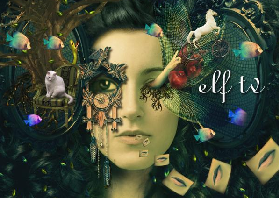 These were so easy to make that you really don't need a tutorial to figure them out, but I'm going to post one anyway, just for fun. If you don't already have the supplies on hand I imagine making your own won't really save you money, but custom items are always fun! There are probably several ways to make these, this is just what worked for me..
-two main pieces in your chosen fabric (I just used a regular cotton fabric for the outside). The first bag I made came out a little bigger than I wanted it to, so I chose to make this one 13 x 9 inches, which would come out closer to 12 x 8 when finished. -two small pieces of your main fabric (these will be going on the ends of your zipper), I used pieces that were 3 x 3 inches just so I had more to work with, but you really only need 2 x 2. Line up the small pieces of fabric wrong side up on either end of the zipper. You're going to sew on the outer edge. Make sure that when you line up your zipper with your main fabric there is at least an inch of the small fabric pieces showing on either side. Flip your fabric pieces over. If you are including a hanging loop, put your zipper aside for now. If not, skip this next part. Using your iron to press after each fold, fold your hanging loop fabric piece in half. Open back up and fold each side to the middle. Fold this in half so only finished edges are showing. You do not need to finish the ends because they will not be showing. 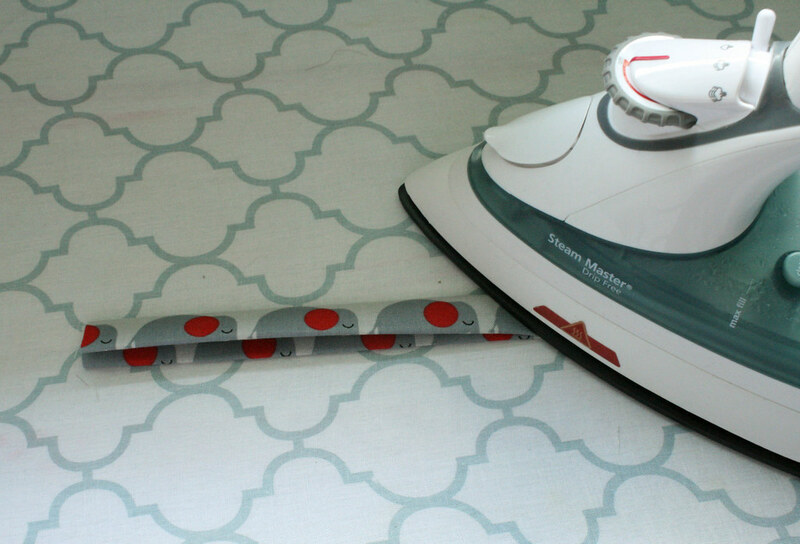 While you are ironing, folding over the top edges of your two main fabric pieces is a good idea. I did not do this with the PUL fabric because I was worried it would melt. 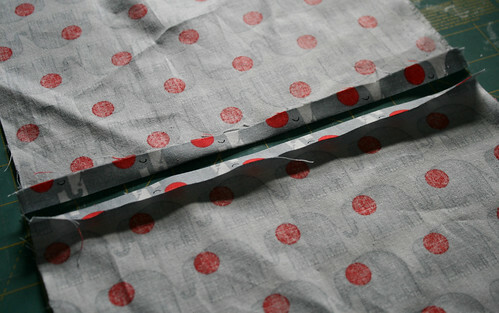 Sew two seams down your loop piece to hold it together. Tip: using thread that matches as closely as possible to your fabric will always make a project look more finished and professional. 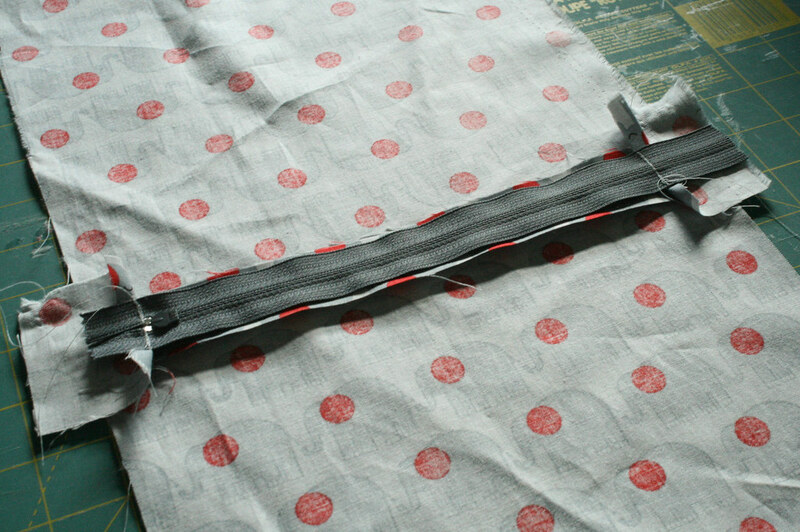 If you are sewing two pieces of fabric together with one seam, use different colour thread for the bobbin and needle. Lay out your two main pieces, tops facing each other, wrong side up. 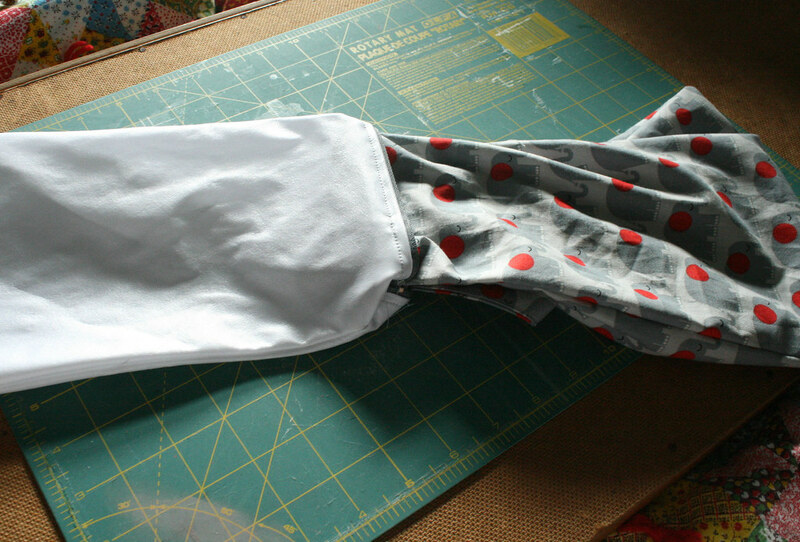 Make sure that you leave a small space between the pieces where your zipper will sit (you still want most of the zipper fabric to overlap your main fabric). 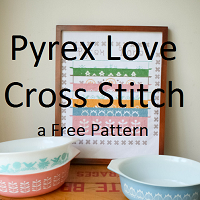 Make sure you have your pattern pieces facing the right way so you don't end up with one side upside down. 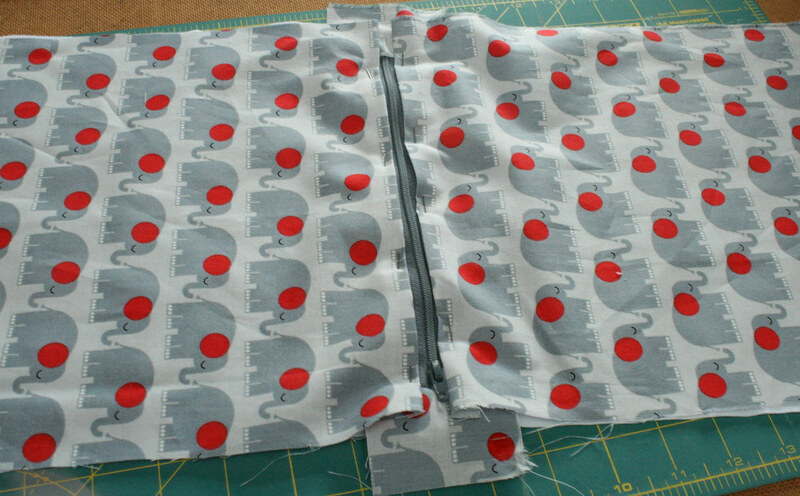 Fold over the top edge of your PUL fabric and place it over one side of the zipper so you are sandwiching the zipper fabric between your main fabric piece and your PUL fabric. The PUL should be right side up (one side will be shiny and smooth and the other a little fuzzy and matte - the shiny side is the right side). 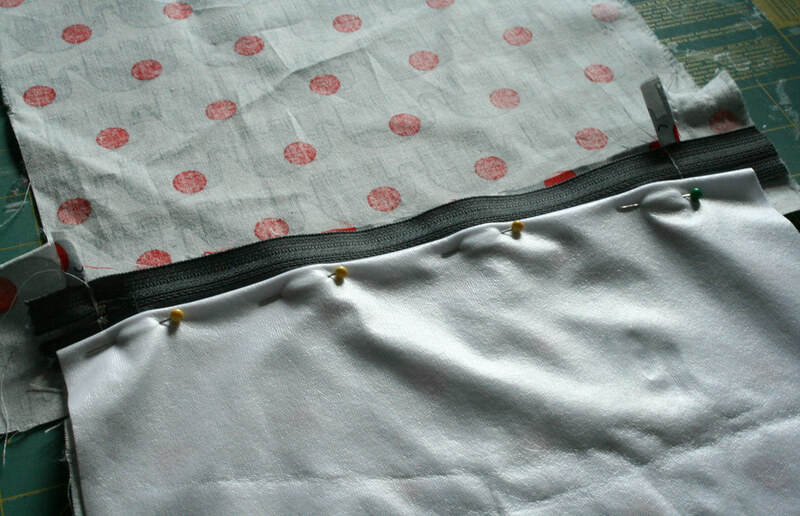 Pin your 'sandwich' together, making sure the zipper fabric is caught between your main fabric and PUL, and that the zipper itself is not covered by either fabric. Do the same thing on the other side. At this point your should have the right sides of your main fabric and your PUL fabric facing out, with your zipper sandwiched between. If adding a hanging loop, slide it in between your main and PUL fabric. 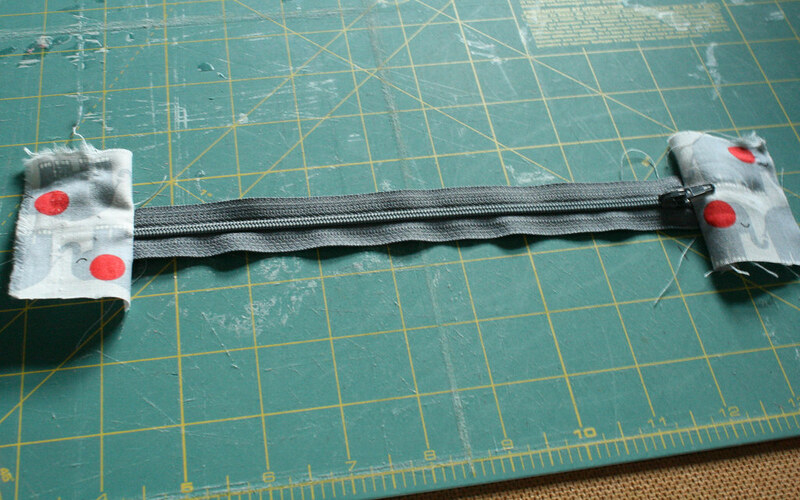 When sewing make sure you do not sew the loop part into your seams, just the ends. 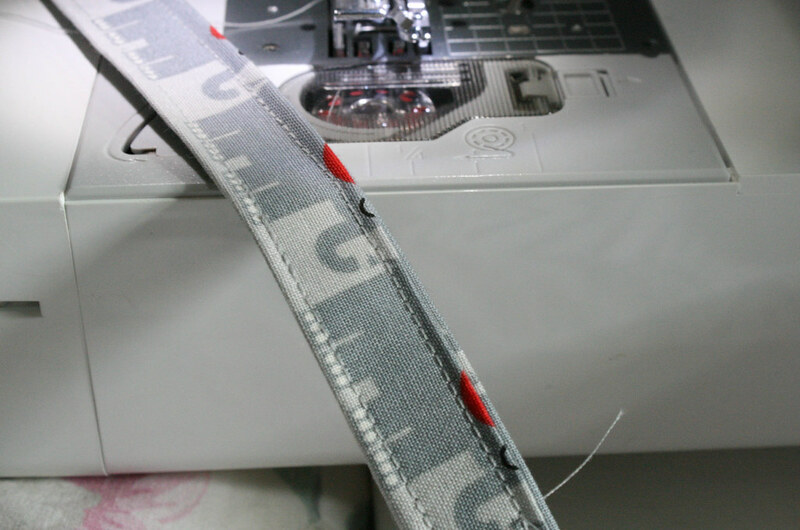 Sew both 'sandwiches' together on eiter side of the zipper (if you have issues with the zipper pull getting in the way of your machine's foot, open the zipper to move it out of the way). Make sure you choose a tight enough stitch length or else liquids will be able to get through. If you need to rip out any seams please be gentle. PUL fabric can tear and any holes will mean leaks. Once your seams are done, flip the main fabric pieces so they are right sides together, and the PUL pieces so they are also right sides together. Both PUL pieces will be on one side of the zipper and the main fabric pieces on the other. 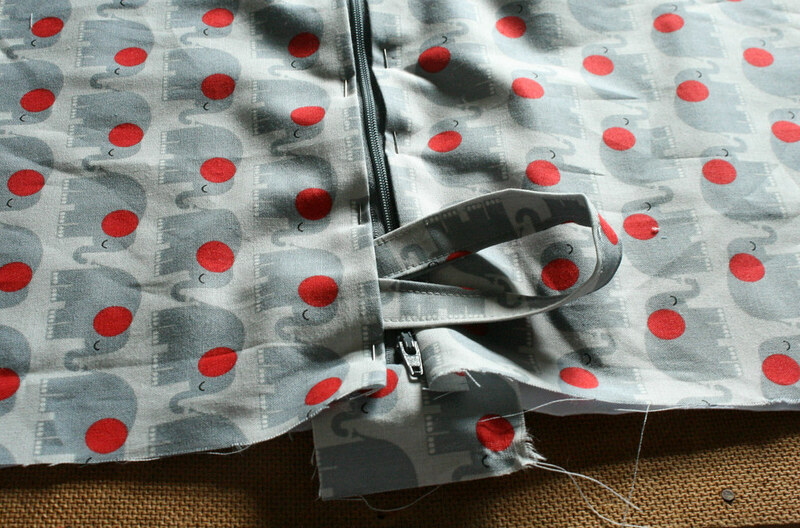 Your small pieces of fabric at each end of the zipper will be folded over so everything lays flat. Making sure the zipper is open, pin in place and then sew all the way around your main fabric and PUL fabric, leaving a gap of a few inches open on your PUL fabric so you can turn your work. 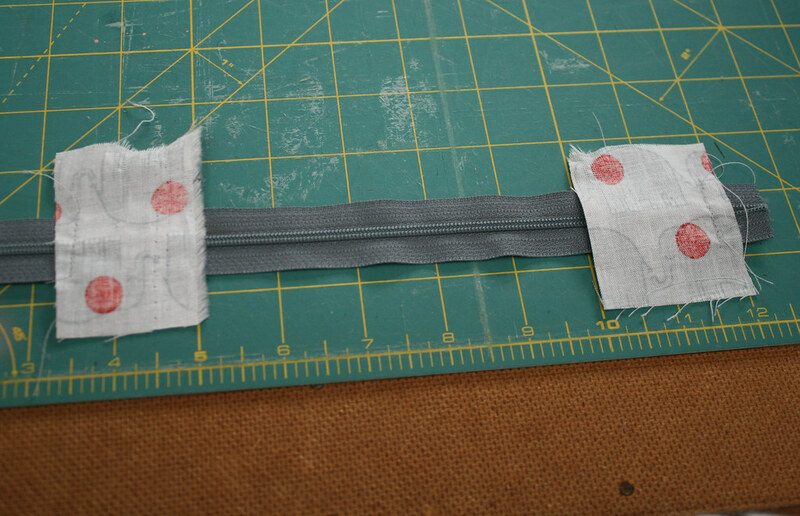 The zipper needs to be left open so the main fabric can be pulled right side out through the hole in the PUL fabric. After ironing your seams (main fabric only, NOT the PUL) and snipping your corners, pull your work through the gap you left in your PUL fabric. Close the gap using either a blind stitch (make sure to use tight stitches) or a sewing machine stitch you don't mind showing. 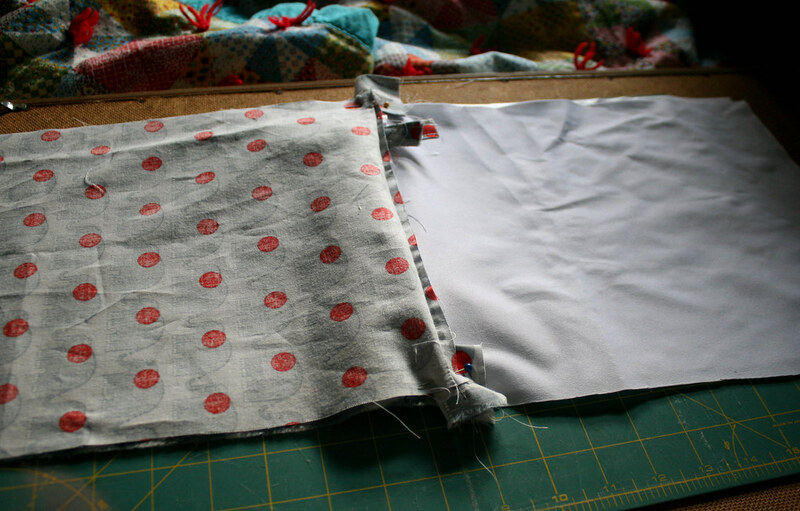 Tuck your PUL fabric into your main fabric. The PUL fabric will keep any messes inside the bag. Now you're ready to use your new wetbag! When it's dirty, just throw it in the wash long with your cloth diapers. Turning it inside out, or bringing the PUL lining to the outside for washing will make sure it gets cleaned well. It would be easy to customize these bags by adding pockets, moving the zipper, using a box bottom for the bag, using more than one fabric, or adding embellishments. You can change the loop to feature a snap so you can hang it around a stroller or bag handle. Those little diapers are so sweet. I always get mushy over tiny cloth diapers. Way to go, sewing your own wetbags. Those things are pricey (and they do wear out).